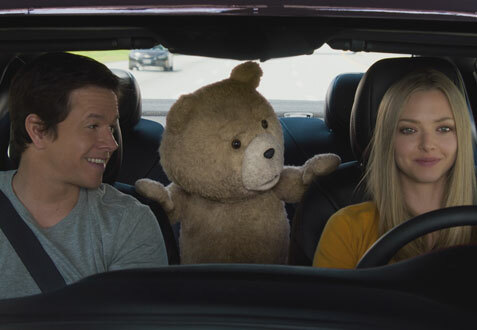 “Ted 2” is a sweet but profane love letter to Universal Pictures. Writer/director/star Seth MacFarlane references several high-profile Universal properties, with the plot serving as the connective tissue. This naturally makes for a threadbare story, to be sure, but this is Seth MacFarlane we’re talking about. The man has never let story get in the way of a good joke, or even a bad one. To the surprise of no one, “Ted 2” has plenty of each. The story begins at the wedding of magical, real-life teddy bear Ted (MacFarlane) and Tami-Lynn (Jessica Barth). 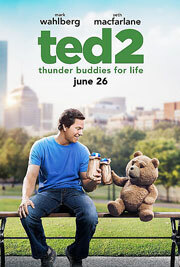 Ted’s best friend John (Mark Wahlberg) is happy for the couple, but still reeling from his recent divorce. Ted and Tami-Lyn have a perfect wedding day, but one year later, they are fighting nonstop. Ted suggests that having a baby might solve their problems (this is a terrible, terrible idea, for the record), but after their attempts to do in vitro or adopt fail, Ted finds his life unraveling as his creditors begin terminating his accounts on the grounds that the government doesn’t recognize him as a real person. John and Ted retain a top-rate lawyer to fight for Ted’s civil rights, and he assigns it to his niece and junior attorney, Samantha (Amanda Seyfriend), who does the case pro bono. While they’re working on Ted’s defense, Ted stalker Donny (Giovanni Ribisi) conspires with the president of Hasbro to kidnap Ted pending him losing the case (as he will officially be considered property at that point), so they can use his mojo to mass produce “human” Teds. There is absolutely no reason for Giovanni Ribisi to be in this movie. Considering what assholes Ted and John are on a regular basis, it would not have taken much for them to make new enemies, especially considering what they do to joggers (yep, in-joke). Ribisi is clearly a friend of MacFarlane’s – this marks his fourth appearance in a MacFarlane-helmed project – but writing Donny into the movie causes more problems than it solves, chief among them is the fact that he’s boring. Theme-wise, the movie is a giant mash-up. It opens with a fantastic musical number, then shifts to the courtroom procedural, with an ‘80s teen movie montage stuffed in the middle (with a spot-on ‘80s-sounding song to boot), at which point it becomes a road movie. At no point does the story come first; it is merely a vessel for MacFarlane to wring laughs out of the situation, usually via a movie reference or a cutaway gag. Normally, this is a bad thing, but MacFarlane makes it work just enough to keep the audience engaged (the improv cutaway is a classic). It is not good storytelling – it’s not even good moviemaking – but it is often very entertaining. There is a gonzo nature to “Ted 2” that is intoxicating. MacFarlane seems to not care at all about maintaining franchise viability, and that is admirable. However, would it have killed him to actually write an original script instead of riffing on the previous work of his financiers? MacFarlane is clearly a smart guy. Pity he’s such a sucker for the low-hanging fruit.